Pop-ups have become so prevalent in the marketing world that even Google has had to weigh in. 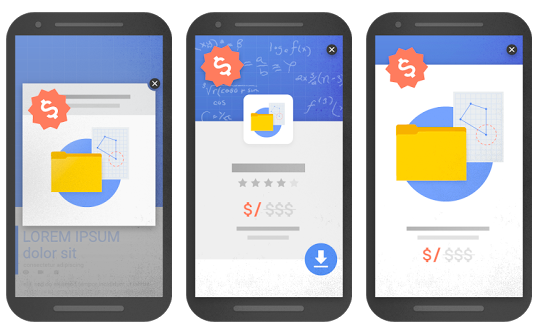 Google recently announced that they will begin to penalize websites that use what they call “intrusive interstitials.” So what exactly are intrusive interstitials you ask? According to Google, intrusive interstitials are anything that makes the content on your website less visible or accessible to a viewer. However, there is a right way to treat pop-up forms on your site that are not only user friendly but also search engine friendly. 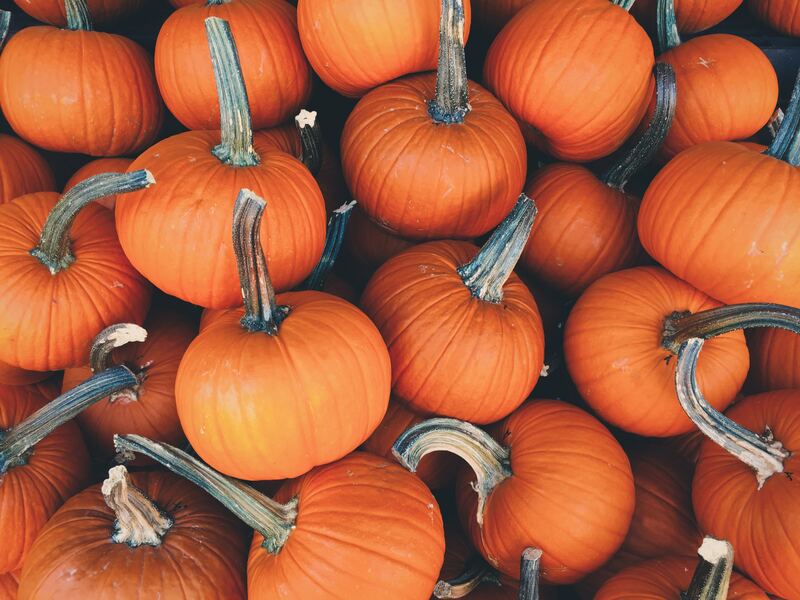 In this special Halloween edition we’re sharing four effective pop-up form tips to help you treat your customers this Halloween and not trick them. Having your pop-ups appear at the wrong time is just batty and adds even more to the annoyance factor from a user experience perspective. It’s important to be strategic about the timing and trigger of your pop-ups. But how do you know the optimal timing? Research and due diligence. For example, by taking a look at your Google Analytics you may uncover that visitors who stay on your pricing page for more than 30 seconds are highly engaged on that particular page because they’re taking the time to read through and consider their options. In this scenario, you could consider using a time-based pop-up that appears when a visitor has been on that particular pricing page after 20 seconds. Other metrics that are helpful to look at to determine your pop-up timing are bounce rates and average time on page. It’s increasingly important to better understand exactly how your visitors are engaging with different pages and content on your site, so use your Google Analytics data to your advantage. When it comes to effective pop-ups you don’t have a lot of real estate to work with. This means it’s super important to really nail the copy that’s included on your pop-up form. When writing copy for your pop-up forms it’s important to be specific yet actionable and of course be human. 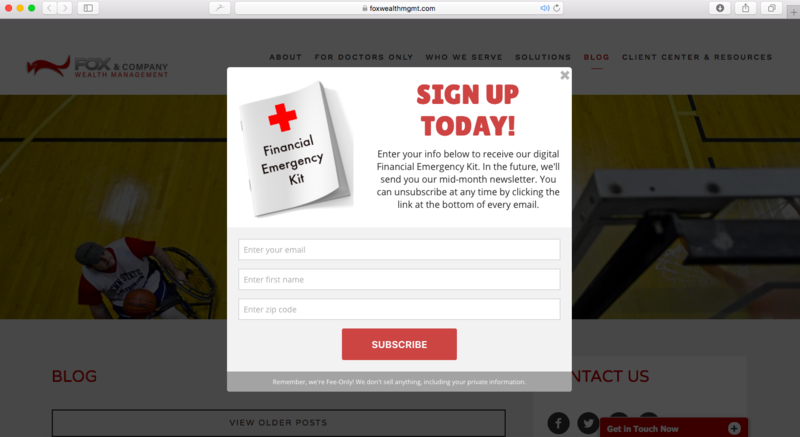 Twenty Over Ten client, Fox Wealth Management, does a great job implementing pop-ups on their blog page to entice visitors to get a free financial emergency kit. In order to entice a visitor to click your pop-up the copy needs to convey exactly what they’ll get by clicking your pop-up. What is the incentive? At the end of the day, your main goal with pop-ups is to compel your visitors to take an action. 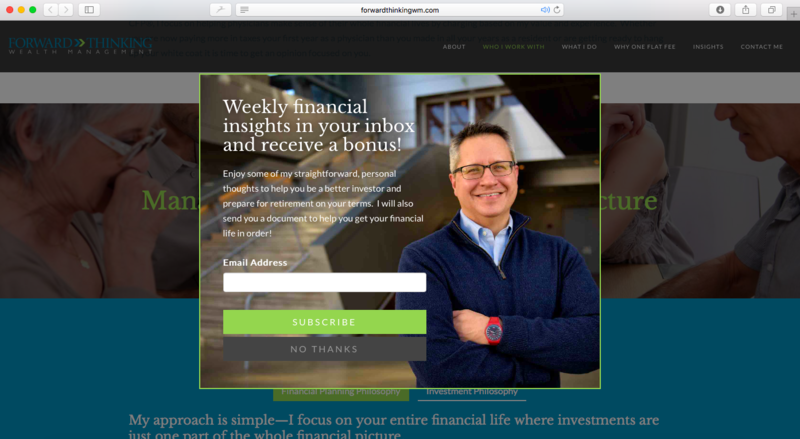 For example, instead of saying “Download Our Free Guide” try “Get My Free Retirement Guide.” Lastly, use colloquial language to make your pop-ups more friendly and human. For example, if your current pop-up reads “Join our email list” and is getting absolutely no sign-ups consider crafting your content to read more something like “Mind if we email you once a month?” You may be surprised at how many more visitors you’re able to win over with some clever content changes. Pop-ups can be a major deterrent for visitors with short attention spans. Implementing a digital marketing strategy like pop-ups can very easily end a relationship with visitors if executed poorly. If nothing else, be 100% sure that you make it easy for visitors to still see your website behind the pop-up. It’s also critical that your pop-up includes a clear “x” in the top right or left corner for visitors to close out if they are not interested in your offer. If you don’t like that approach there are other creative ways to enable visitors to “opt-out” of your pop-up. For example, you could include a CTA next to your opt-in button that says “no thanks” or “keep learning” that would close out the pop-up and redirect users back to your website. Twenty Over Ten client, Forward Thinking Wealth Management, implements well-designed pop-ups on their website for lead capture. As mentioned earlier in this post, being able to time your pop-ups in accordance with your Google Analytics is key. Similarly, exit-intent technology also enables us to detect when site visitors are navigating away from your site or closing their browser. We also like to refer exit-intent pop-ups as a “last ditch effort” since they appear once your visitor has decided to leave but you have one last opportunity to try and “sell” them. Exit-intent pop-ups are a fairly new technology that is becoming more popular for many reasons. One main reason they’re gaining more popularity is because they’re seen to be more user-friendly as they don’t interrupt visitors while they’re browsing your site. Rather, they only appear when your visitors signal they’re leaving your site. Design does matter and consistency is key when it comes to pop-ups for your website. If the colors in your pop-up aren’t consistent with your brand and don’t blend well with the overall look and feel of your site users may think it’s spam and abandon your site all together never visiting again. 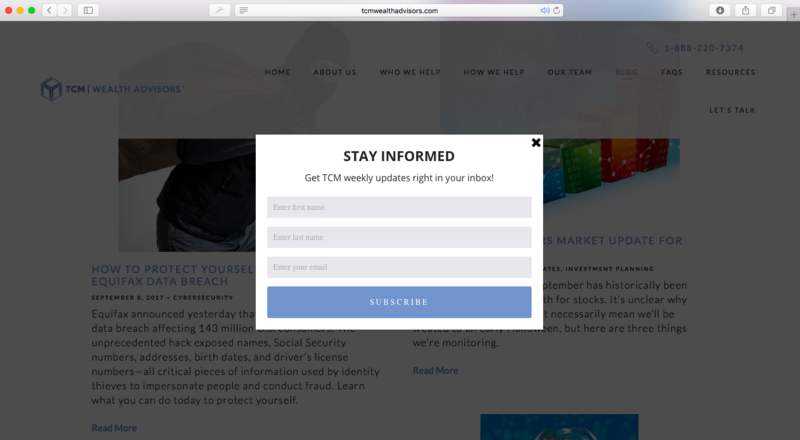 Twenty Over Ten client, TCM Wealth Advisors, is strategic about placing pop-ups on their site to encourage newsletter sign-ups. This brings us to color psychology – yes it’s a real thing. People respond differently to different colors and in the world of pop-ups it’s important to take this into consideration when designing your boo-tiful pop-up! By having a simple, clean design you can make the decision-making process easier for your visitors. Free pop-up tools like Sumo come equipped with pre-designed templates to choose from that can also be customized to fit your firms needs. There is no end all be all answer to which colors lead to higher conversion rates so it’s important to test, test, test. Every audience is different so by determining which pop-up converts best you have to test and retest until you find the option that works best for you. Many pop-up tools like Sumo offer A/B testing to help you test to determine which pop-up variant works best. Effectively marketing your new financial planning business is vital to the success of your new practice and it all starts with your online presence. From building websites to social media and Google Analytics Twenty Over Ten is here to help!